Watching the Olympics recently, perhaps you found yourself marveling at the feats capable to the finely-honed human body. Did you also wonder what these amazing athletes do when their moment of sports fame has passed? Here's one such story. In 1983, the French Open trophy returned to France for the first time in 40 years, secured by on Yannick Noah. He's remained popular in his homeland, making a list of "Top 50 Most Popular French Personalities." Starting October 9, Noah will be looking for acclaim for a very different project: a new album of his versions of Bob Marley classics. This appears to be his 10th album, though I'll admit to ignorance of his discography up to this point. But even without that context, I can assure you that this is an intriguing album. 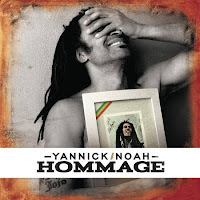 Not just a retread of reggae classics, these mostly acoustic versions have a French breeziness that doesn't take away from their original rebellious power. Indeed, it's refreshing to hear someone not just covering Bob, but reinterpreting him. The "reggaeness" of Noah's songs may be light, but the appeal of his sound will be broad.